Published originally in 1976, this edition published in 2002. Challenges - A to Z Book and 100+ books. Your ad in the Saturday Review of Literature says that you specialize in out-of-print books. The phrase 'antiquarian book-sellers' scares me somewhat, as I equate 'antique' with expensive. I am a poor writer with an antiquarian taste in books and all the things I want are impossible to get over here except in very expensive rare editions, or in Barnes & Noble's grimy, marked up school boy copies. I have to say a big thank you to Nymeth for recommending this book. If I had not read her wonderful review, I would never have picked it up and it is one of those books that I have now fallen in love with. I was lucky enough to pick up a copy which had the follow up book in called 'The Duchess of Bloomsbury Street' and found it was also a fabulous read. 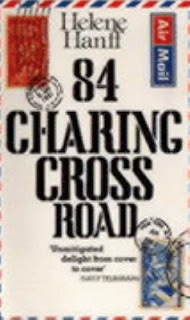 84 Charing Cross Road is a collection of letters sent from Helene whilst living in New York to Frank Doel, a bookseller working in a book shop called Marks and Co, which sold rare and second hand books. The book shop was situated in, yes you have guessed it, 84 Charing Cross Road. Over the period of twenty years, the outspoken American sent her book demands to Frank. Their friendship developed over the years and Helene got to know other members of the staff, as well as Frank's family. Due to enforcement of rations in Britain, Helene began to send food parcels to the shop to help supplement their meagre rations. As time progressed, their letters progressed to personal matters and continued right up until Frank's death in 1969. All through the book, Helene is insistent that she will eventually get to England to visit her beloved friends in the bookshop. Unfortunately she does not get the opportunity to visit until after Frank's death. The book The Duchess of Bloomsbury Street is a travel journal of her visit in 1971, where she details the promotion of her book and meets with Frank's family and makes lots of new lifelong friends. Both books were just wonderful to read. It is one of those books that you could just read over and over again. Helene's style of writing is warm, funny and charming. She sounds like one of those people you could sit down and chat to over a latte and slice of carrot cake, not noticing that you had polished off the whole cake in one sitting. Hanff is happy to make fun of herself and shows that she has all the same human tendencies as the rest of us, such as impatience and the odd temper tantrum. Helene's love of books is in infectious and you soon find yourself coveting the books she loves to read over and over again. 84 Charing Cross Road has a similar feel to it to The Guernsey Literary and Potato Peel Pie Society, only this book is the real deal. 84 Charing Cross Road depicts real letters and real events and was written many years before. This is one of those books which is not fast paced, but takes you on a gentle pleasurable stroll with very little happening along the way, but by the end of your stroll, you have a warm fuzzy feeling in your heart, a smile across your face and you realise you have unexpectedly fallen in love with her writing style. I have been left with a thirst for more of her work and found that there is a Helene Hanff omnibus which has all her books under one cover, so that little gem will be added to my Christmas wish list. If you read these, be prepared to read it in one sitting as I doubt you will be able to put it down. This was made into a film in 1987 with Anthony Hopkins and Anne Bancroft playing the leading parts. I shall definitely keep a lookout for this on my travels. great review. this is one bookk that i've been meaning to read. Getting to Manana is one i have not heard of --need to check that out! have a good week. I'm so glad you loved it as much as I did, Vivienne! I need to read The Guernsey Literary and Potato Peel Pie Society, and also to look for that omnibus! I loved Guernsey and have been wanting to read this ever since I saw it compared to it. Great review. These are such charming books aren't they? I read them several years ago, but keep forgetting to rent a copy of the movie to watch. Your review of the books is lovely! Thank you for mentioning at the end about the movie - I was going slightly mad trying to figure out why all of this seemed vaguely familiar to me. Lovely review, if this has a Guernsey 'feel' to it I know I'll love it. Great book & a really fun movie, too!